EL PASO, TX - March 5, 2014 - Downtown El Paso's ballpark has a name - Southwest University Park. In a highly anticipated naming ceremony held in Cleveland Square this afternoon, representatives from the El Paso Chihuahuas along with Southwest University President, Yolanda Arriola, announced the official name of the ballpark. Also present for the event were officials from the City of El Paso. "It's an exciting day when we get to reveal something as significant as the name of the most prominent new structure in El Paso. In less than two months, "Southwest University Park will be an attraction for family fun and entertainment," said Alan Ledford, President of MountainStar Sports Group. "We at Southwest University are extremely excited to become a part of the Chihuahuas' baseball family," said Yolanda Arriola, President of Southwest University. "Through this partnership we will continue to bring pride, excitement, and opportunity to our students and the El Paso community." 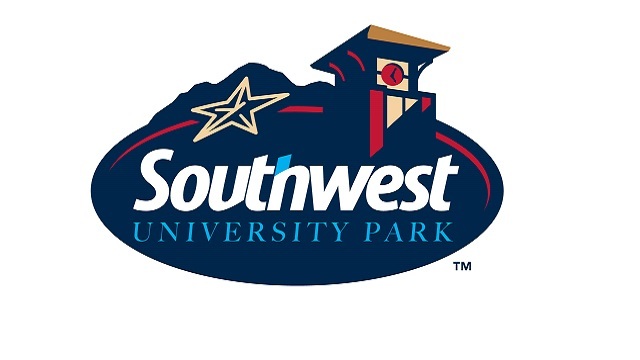 The name, Southwest University Park, will be seen throughout the ballpark, most prominently at the entrances to the facility. The marquee logo piece will be located on top of the video board, which will be visible from inside the park as well as from downtown vantage points. The name will also appear on store merchandise and collateral pieces, across digital media and in advertising campaigns. Founded by the Arriola family in 1999, Southwest University began creating local partnerships with the business community to build a curriculum in the fields of medical administration and health care support, as well as in technical areas of concentration. It earned official accredited university status in 2012. "Southwest University and the Arriola family are committed members of this community, and their enthusiasm for El Paso and this Ballpark makes them an ideal partner," said Brad Taylor, General Manager of the El Paso Chihuahuas. "They'll be a part of our team for years to come." The contract with Southwest University is part of a 20-year agreement which extends through 2033.